Digital Surrogates from the Council of Administration Records contain digitized minute books (1900-1905), including petitions and correspondence concerning policy changes, lists, and committee reports; accreditation and admissions (petitions for waivers or altering requirements); student disciplinary matters (probation and dismissal); fellowships; student loans; athletics; conferral of degrees; military affairs; student welfare; advanced standings; and press notices. Original material can be found at Record Series 3/1/1, Box 1. The entire series includes three volumes of indices for the years 1894-1931. 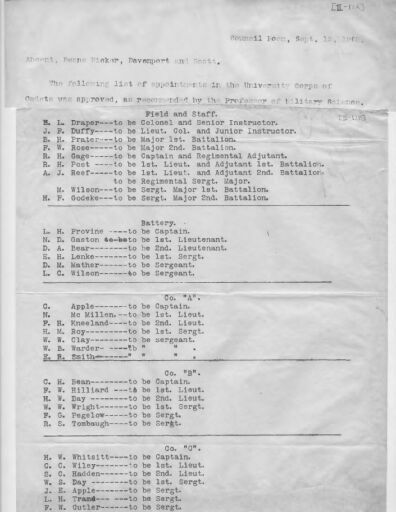 The Council of Administration Records (Digital Surrogates), 1900-1905 are managed by the University of Illinois Archives and do not feature precise descriptive information for each item. Discover their contents by browsing the folders and files. For more information, contact an archivist at illiarch@illinois.edu.